Welcome to the world of ooey gooey goodness. 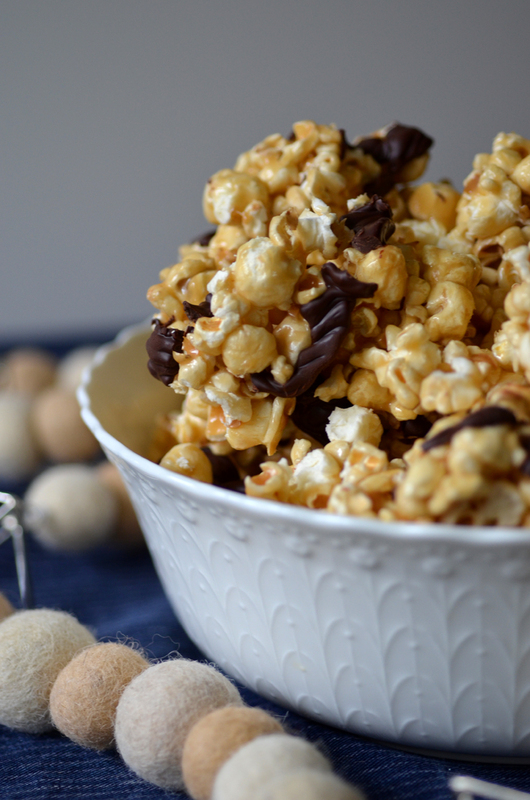 This caramel popcorn is so delicious you may just eat it all yourself. And beware, there's no stopping once you've started. It's like Cheetos. 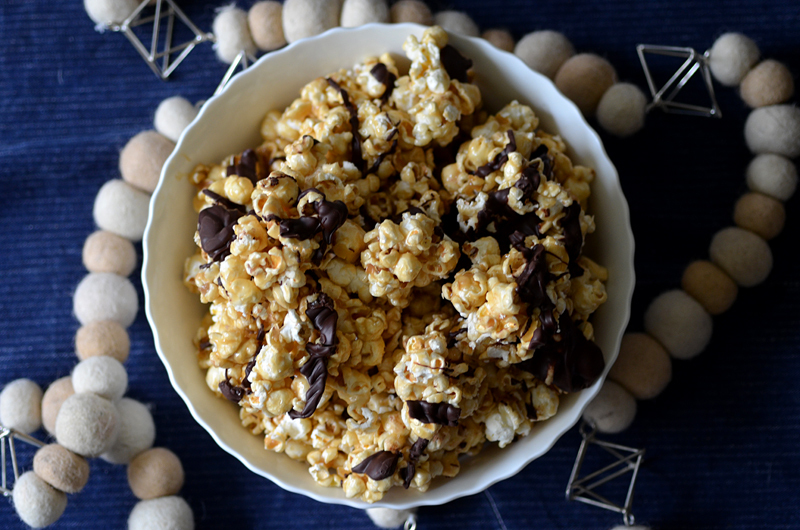 Once you eat one, you'll probably end up eating the whole darn bag. Today I was, (like most bloggers do) looking at my stats for last month. I am always a little surprised to see that among the popular posts is My First Post. It makes me laugh every time I read it. I love to think back to only a year and a half ago when I was starting this blog. I never thought I would have come this far. I had no idea it would mainly end up being recipes (but I love that it did haha). And I would have never guessed the amount of things I would learn from this wonderful journey. Everyday, even when my pictures turn out terrible (like today I took pictures of chicken noodle soup, oh my goodness who new it was so hard to take pictures of that stuff), I am ALWAYS thankful for this blog, for the things I have learned, and for the people I have helped. Every time someone tells me how they made something from this blog and loved it, it makes my day, no more like it makes my month. And those are the things that make me keep going and (even when my family hates me having to take pictures) I keep trying to be my best. So thank you for being here! 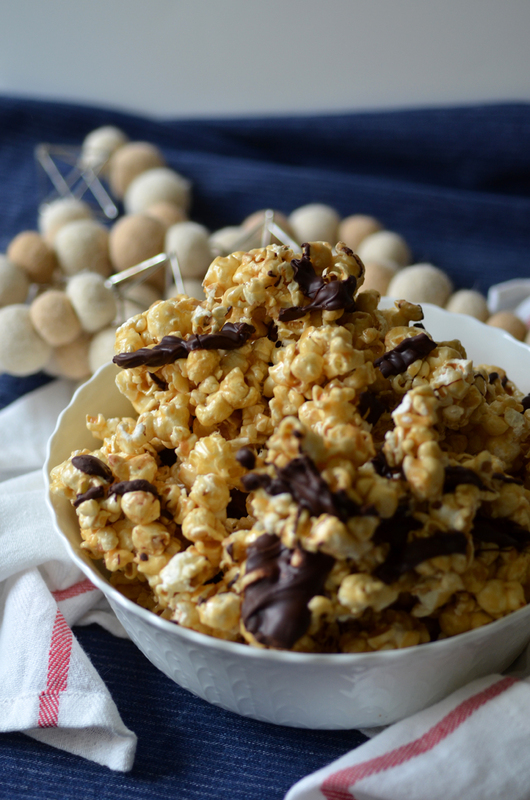 Thank you for reading this and for trying these recipes! YOU are why I do this. Okay enough of that. 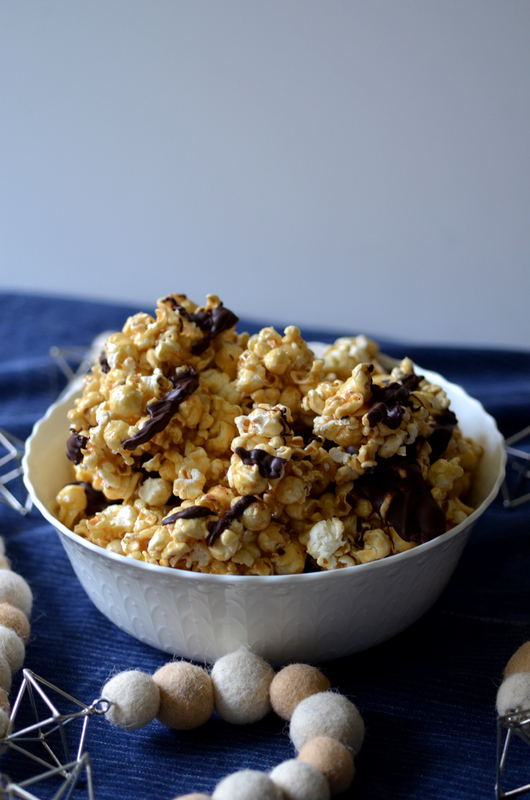 Let's talk about this popcorn. 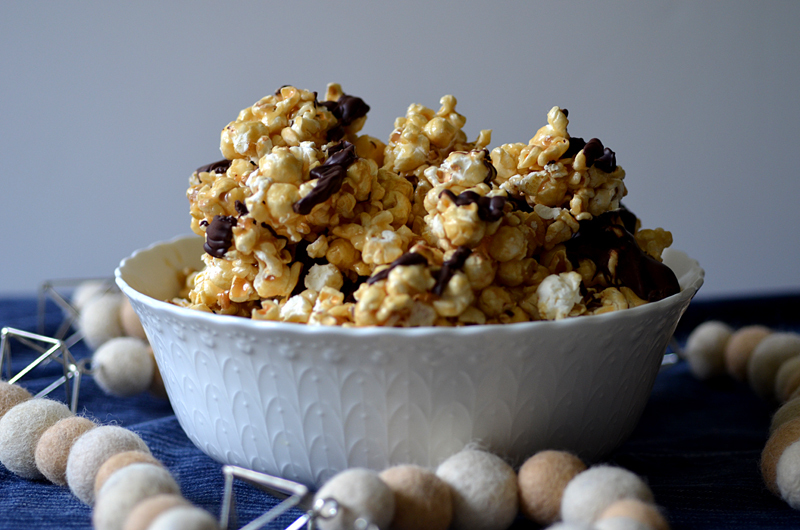 OHHHH this popcorn! It is soooo wonderful! My mom used to make this for neighborhood Christmas gifts and my neighbors always raved about it. It really is so yummy. You don't have to add the chocolate, but it's like the icing to the cake. It makes it to die for! My dad says the chocolate is not optional hah! 1) In a large sauce pan, add brown sugar, butter, Karo syrup, sweetened condensed milk and salt. Bring mixture to a boil. 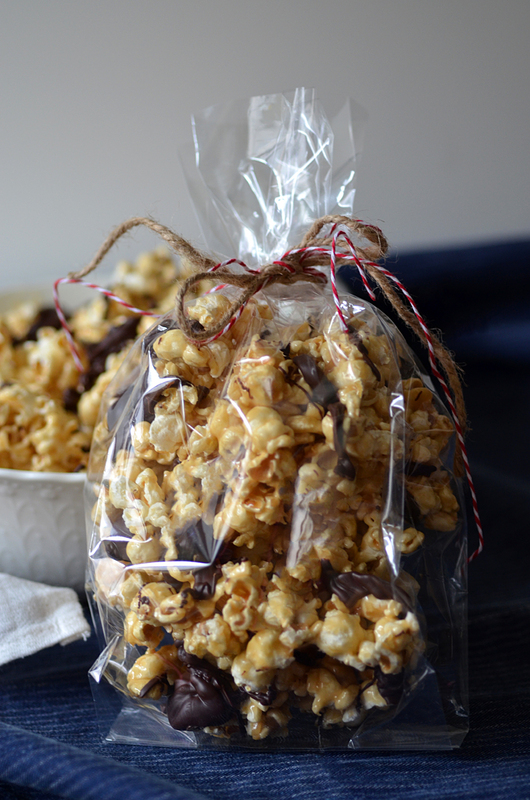 2) Place popped popcorn in one giant or two large bowls and pour caramel mixture evenly. Stir until coated and spread onto two baking sheets lined with parchment paper. 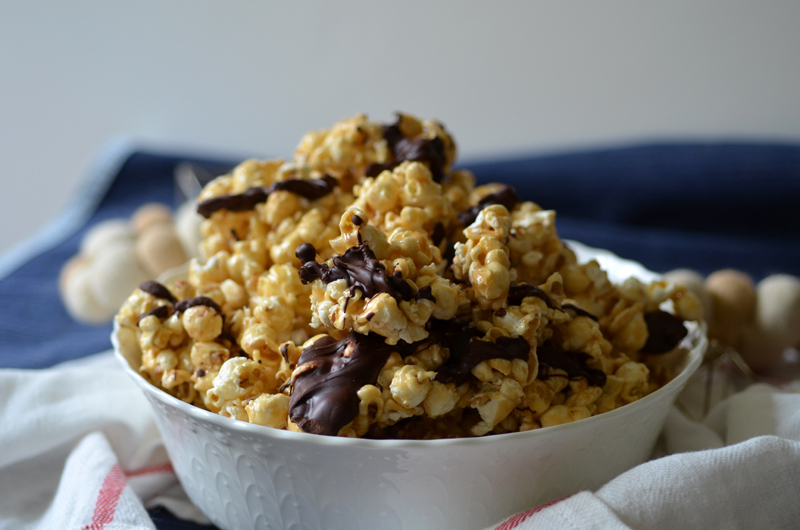 3) Drizzle melted chocolate on top of popcorn, while still a little hot. Let cool and enjoy!